KIEV, Ukraine -- Ukraine will begin building a wall on its easternmost border with Russia, the governor of the war stricken Luhansk region told the country’s Channel 5. A member of the Ukrainian armed forces is seen near the town of Maryinka, eastern Ukraine, June 5, 2015. Ukraine's president told his military on Thursday to prepare for a possible "full-scale invasion" by Russia all along their joint border, a day after the worst fighting with Russian-backed separatists in months. Since last February a tense ceasefire in Ukraine’s eastern Donetsk and Luhansk regions has neared a collapse several times, but has largely held. 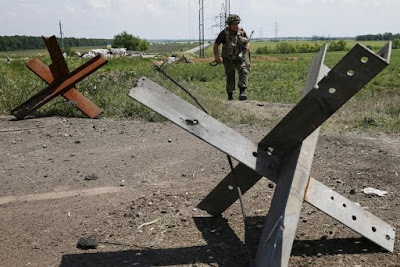 In 2014 Ukraine’s Prime Minister Arseniy Yatsenyuk unveiled a $517 million plan to reinforce its borders with Russia in the hope of cutting off alleged Russian support for pro-Russian forces in Ukraine. The project has stalled, with less than 10 percent of it reported complete by August 2015, with work focusing primarily on the western most parts of Ukraine’s border with Russia, far from the conflict in the east. According to Georgy Tuka, a former volunteer fighter, who was appointed head of Luhansk region in July, the region is ready to begin work on its part of the project. “In Luhansk region work on this project has not begun at all,” Tuka said. Parts of Luhansk and Donetsk regions’ borders with Russia are held by rebels and it still remains to be seen how construction will be carried out there. Tuka dismissed the possibility of the wall being used to delineate internal unofficial borders, such as the line of contact with rebels. “We are talking about reinforcing Ukraine’s border with Russia. This does not affect the line of contact,” he added.